I’m writing this while on a plane from Sweden to Toronto. I have 5.5 hours left to kill and am out of new episodes of ‘How to get away with murder’ to watch. I thought about the day I’ve had so far and wanted to comprise a list of common mistakes I make when travelling, so maybe some of you won’t do the same thing! I left the house at 5:00am for my 7:55am flight. Those of you who know anything about me, know I am NOT a morning person, so eating before I am awake for at least an hour is out of the question…(IF I have to wake up in the 5’s, 6’s, or 7’s, I want to vomit). Around 6:30am I started to get hungry, but my only option in the airport was a cheese sandwich and a bottle of water. I bought them. Total cost, $21.00cad. 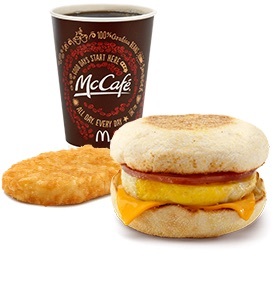 While picking up my jaw and paying for my tiny sandwich and water, I miserably realized that I could have had THREE McMuffin Combo Meals from McDonalds, and it would have tasted so delicious. Tip #1 – EAT BEFORE YOU GET TO THE AIRPORT! I usually pick an aisle seat. I guess it stems from travelling with my beautiful fur-baby Rambo for so many years, as it made it easier to get in and out with him. But since he passed away, and I am a lone traveller now, I got crazy and took a window seat. Best. Decision. Ever. I slept for 3 hours straight (something I have never done on a plane) *Getting comfortable on the plane is the bane of my existence. I have awakened on a stranger’s shoulder, tried sleeping on the tray table only to have the person in front of me ram their seat back into my skull, and one time I woke up and had no feeling in my right leg from my hip bone to my toes and was fairly certain I was paralyzed… (again, I’m a hypochondriac). Note, I brought my fleece poncho/blanket with me and used it as a pillow. 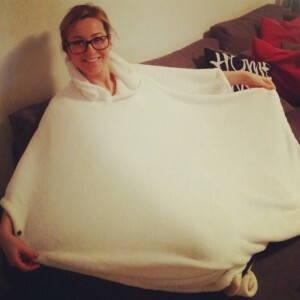 This is a MUST HAVE as I’m pretty sure the blankets they give you on planes are made of tissue paper, so bring your comfiest/smallest blanket with you. Okay, so I know this isn’t necessarily the most attractive thing I’ve ever worn, but let me tell you, I feel like I’m sitting in a cloud. I HIGHLY suggest you get yourself one of these bad boys. I need to remember to bring a water bottle with me, but I forget 90% of the time. I HATE paying $8 for a small bottle of water at the airport (just ask Jeremy about the Fiji water incident….) but hydrating is necessary. Planes dehydrate because it is a low-humidity environment and you need to take in more water than you usually do. I always ask the flight attendant to fill my water bottle as soon as I’m on the plane and I drink the whole time. My body and skin(remove*) thank me. Hydrating prevents respiratory issues, dry skin, and helps prevent viruses from entering your system, as we all know planes are a cesspool of germs. Me after a 16 hour travel day using my Brita Filtering Water Bottle. Plane rides can either be a huge waste of time, or be put to good use. I use this time to read scripts/learn lines, catch up on shows, read, write, knit, and I even gave myself a manicure once…(In retrospect, I am fairly certain everyone on the plane hated me after the last one), but you get the point. Plan in advance, and bring things to keep yourself busy. You will feel much more accomplished when you land! It’s important to get up and move around during long flights. (Blood Clots can develop and I’m a bit of a hypochondriac, so this is a MUST DO for me). It also is nice to stretch your body out and sitting in one position for a 9 hour flight makes you really sore the next day. Get up once an hour, and if possible, try and book a massage for a few days after you land to get your muscles unknotted from the trip. If you are an electronics lover like me, don’t forget your computer, phone, and chargers. Planes have plugs/USB ports in each seat now, which is necessary to keep everything running for your trip, and after! TEXT/CALL/WHATSAPP/iMESSAGE your ride before the plane takes off. Things change and the captain will tell you pre flight if you will be delayed landing. Always let your ride know, or at least give them your flight info and tell them to search it on www.flightaware.com. (Everyone in my family tracks my flights, and I love turning on my phone to 10 messages saying WELCOME TO TORONTO!! I also always track flights.. CAUTION it is possible that the tracking will say ‘flight is off the grid’. Don’t panic, it is a common glitch. I almost had a heart attack once when my parents flight to Germany went off the map… I was ready to call CNN). So keep everyone posted, nobody likes waiting at the airport for any longer than they have to, so keep your ride posted. Don’t stress about flying. You’re safer flying than you are any other mode of transportation, so sit back, relax, and enjoy the ride! Hope this helps some of you. Post any tips that help you get through long flights below! Good tips. For me a must have is my ipod. I’m incredibly old school when it comes to technology so I still rock the old school flip phones. hence no music on my phone so I NEED my ipod. The most recent time I flew I forgot my ipod. I was absolutely misreable. As far s seat selection goes I will always pay for m seat of choice. Flights 5 hours or less I will always chose a window seat, preferably on the right side. I like leaning to the right better and it’s easier on my left knee not being up against the wall of the plane. If the flight is longer than that I will choose the aisle seat, again preferably on the right side so I can stretch out my left leg. I choose the aisle seat on longer flights so I can get up whenever I feel like it without disturbing the people beside me and I don’t mind getting up for them. I couldn’t ever imagine sitting in the middle seat unless it’s a premium seat I’ve paid for because it’s about double the size of regualr seats. Those are sweet. Lastly I agree 100% about the bottle of water. I need to have it even if I dont drink it. 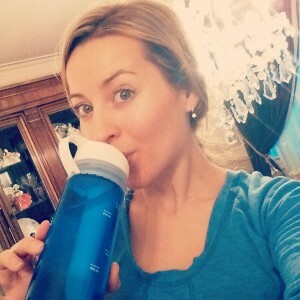 I carry water with me everywhere I go so a plane ride is no different. Upgrading is DEF a must if you can afford it or can use your points. Ipod is a necessity too. Good additions to the blog! Thanks for all the great tips! I’ll be sure to look this over in the future if I’m ever flying. Turbulence is the worst!! Sounds like you guys got to see some amazing things though! Thanks for the tips, I travel at least once a year and almost always more than 8 hours and these are really useful. I usually forget to eat before early flights then I get hungry at the airport later regretting the money I spent. I didn’t know they had plugs/USB now on planes and I am happy to know this now. Thanks for mentioning the http://flightaware.com/ I didn’t know this was a thing. I haven’t been able to sleep on a flight ( no matter my best efforts) in over five years, it’s like the moment I hit middle school nope no more sleeping on planes because of this I’m happy to have some good flights on my list. My best was my class trip to France both going there and coming back. Going I was sitting in a two seater with my friend with me in the aisle seat, she never got up during the entire nine hour flight because she was sleeping during most of it. Returning I was again in a two seater, my neighbor actually went to sit next to his friends so I got two seats all to my self . What was your best flying experience? One time on my way to LA I had 4 middle seats to myself! I literally had the best sleep and woke up right before landing! I love traveling, so I totally understand this text hahaha. Always get flights at night, so you’ll just eat and sleep. Even thought the nor the food neither the seat are the best, I’m sure it all worth! 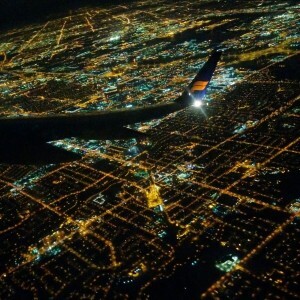 Night flights are key! Helps with jet lag! Great tips! Fun fact to go a step further in tracking flights of family/friends check out a website called flightradar24 which has a cool layout of tracking flights. If you look up LiveATC (air traffic controls website) you can find the towers for different airports ex. YYZ departures or arrivals and listen to the actual flights as pilots prepare to leave or land! I remember using it for my brother’s flight. It was incredible hearing the pilot preparing for take off, knowing my brother was on that flight. Never realized the importance of stretching your legs on flights until this post… definitely going to keep that in mind whenever I fly again! MD’s Is Awesome to Have. What is your Favorite Thing Ashley? Thanks for all the support! Love you guys!! These are great tips I also often forget water. I tend to have extreme pressure on my ears so gum and lots of it is a must for me. As well as making sure I have warm layers (I tend to get cold on flights) but if need be I can take some off once I land and no longer need them.